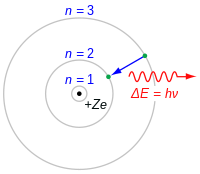 As an electron approaches a nucleus from infinity, it becomes 'bound' - it is attached to the nucleus, if you like. In this bound state, the electron occupies what is called an energy level. A nucleus has a discrete number of energy levels, and so electrons bound to a certain nucleus can only take on certain potential energies. These energies are negative by convention. The lowest (most negative) energy level is denoted n=1, the next lowest n=2, and so on. The values of these can be found using formulae which you don't need to know about. Alternatively, they may be determined experimentally. Energy levels in a hydrogen atom. The transition shown from the n=3 level to the n=2 level gives rise to visible light of wavelength 656 nm (red). where E is energy, h is Planck's constant (6.63 x 10−34 J s), f is frequency, c is the speed of light, and λ is wavelength. The energy levels of different nuclei are different. Evidence for these energy levels comes from the emission and absorption spectra of atoms. An emission spectrum can be obtained by heating a sample of an element. This gives the electrons energy, so they jump up the energy levels. At random, they then jump down again, giving off photons with measurable frequencies. The formulae above can be used to calculate the difference in energy between the levels between which the electrons have jumped. An absorption spectrum can be found by passing light through (for example) a gas, and observing the frequencies of light which are absorbed. These frequencies correspond to jumps between energy levels which electrons have undergone when they absorb the photons, gaining energy. It should be noted that electrons do not always jump to the next-door energy level - they can, in principle, jump to any energy level. They cannot jump to an energy which is not that of an energy level. The value of 13.6 is a constant by itself but is made up of a combination of constants from the derivation of the Bohr radius and Energy Levels in Hydrogen. 1. Calculate the potential energy of an electron at level n=2. 2. Calculate the difference in potential energy between levels n=2 and n=3. 3. What is the potential energy of an electron at level n=3? 4. If an electron were to jump from n=7 to n=5, what would the wavelength of the photon given off be? This page was last edited on 13 October 2018, at 16:43.